Niamh, as you can see for yourself, I did discover we did have in fact Photoshop now on the computer and I could size the pic down properly. Thank you so much for the offer of help with that! I saw the new Maedhros of Chmiel's - for some reason I never conciously registered it as a clearly phrased thought but her Maedhros has quite a different hair-colour than Jenny's. Don't ask me where my head was until now! A lot of Chmiel's Maedhros pics are in black and white, so it's hard to guess at hair colour in them. However, in this pic his hair seems much the same shade of red as Jenny's Maedhros. Maybe it's a little more orange, but it's just as bright. In this and this pic, though, his hair is more of a dark auburn shade. Is that the difference that you were reffering to? I wonder which of the colours is more what Tolkien had in mind? In HoMe XII, it is said that Nerdanel had "red-brown hair." That seems to indicate a darker auburn. Likening Maedhros's hair to copper, however, seems to mean a lighter shade. In my own mind, I see Maedhros with very bright, though rich in tone, red hair. And SW :):):):):):):):):)N for Maglor, who I think is particularly beautiful in that first Chmiel pic that I linked. The picture I had before my eyes was the one with Maglor, Maedhros, Elros and Elrond, the more orange toned was what I meant. As to what JRR might have had in mind - something between dark auburn and coppery copper, in my mind it is quite the same I used to have before the red started to go out. A Big Sw :heart::heart::heart: NNN!!! for all the stunning pics I had seen but cannot help but feel weak at the knees for that Doni linked. Well this looks like the sort of place I should be, but it seems rather quiet at the moment! Anyone around? Aurelin? Rowanberry? Anyone else?Anyone got links to new pictures? Yeah, it has been quiet after Doni went to the uni. It is lovely to see the thread up on the list. Hmm, not any new Sil pics of Jenny's have come, I think, since the last this thread was posted in but there was a rather nice Elven Trekker for the Quest Cards. Hey, the Sons of Fëanor Fan Club still exists! Nope, no new paintings of Sil characters to swoon for; so, maybe I'll sw n for Ulmo for a change, just because unlike the other Valar, he didn't abandon the Exiles. Ulmo has got my SW :):):):):):) NNN!! for that too. Yeah, we are alive, sort of ! Like the Oath that rose its head and then pulled to the background. Lady Aranis, I love your drawing of Nerdanel! I find her an interesting character. She had to be quite the woman to deal with that husband and their seven sons! I've got four pictures of him on my walls in my dorm room at school, and my roommate actually remembers his name and enough of his story to have actually explained him a little to one of our visitors. I told Aurelin this already, but there is a guy at my school who looks almost exactly like Jenny Dolfen's portrait of Maglor. His facial features are much the same, and he has the most beautiful long, dark hair. Yes, he's quite swoon-worthy in his own right. I think my room-mate is getting tired of my exclaming how elf-like he is. P.S. Aurelin!!! You changed your alliance! Is there any particular reason behind the change, other than the fact that you like some of the sons of Fëanor? I thought I'd make this official, Doni, that is all! I felt that Maedros' picture and Elwė's symbol would not really go together and if I had to choose one or the other, you can guess which got on top. I have explained them to my mother as well plus the Nirnaeth and Fields of Gold pic of Jenny's and two ASOIAF artworks. SW :love::love::love: NNN!!! for Maitimo because his mother named him well! Aurelin, I love the poem in you sig. Did you write that? I told Aurelin this already, but there is a guy at my school who looks almost exactly like Jenny Dolfen's portrait of Maglor. His facial features are much the same, and he has the most beautiful long, dark hair. At once I saw that portrait of Maglor, I thought of one of my husband's schoolmates (who, by the way, is a musician!) - in one of the old school photos, he looks very much like Jenny's Maglor, just that his hair is not black but brown. So, a sw n for the Musician Prince this time! And, Merry Christmas, or a joyful whatever other holiday you may be celebrating, to all you Sil swooners! :D My Maglor-lookalike friend is also a musician. He plays a drum set (and other forms of percussion) and electric guitar in various student bands. Also, his areas of study are philosophy and religion. So, I guess he's got the makings of being a modern-day Elven bard. Thanks for the comment on the picture, Doni! Early days still with my drawings! , but practicing a lot of Maedhros and Maglor! Aurelin..I agree that his mother named him well! I am going to swoon for Ulmo, because of the reasons you have already mentioned! And I think he is sort of 'seasonal'! Yes, Doni, I wrote that poem, inspired of course by the artwork beside it. You know how I feel about my ability to write poems, so your compliment made me smile. So, I'm the only one here not to have a Fėanorean look-alike friend, relative or other! . How can it be!? BTW, Lady_Aranis, I did jump on my chair, thinking that by the long-haired version you meant the kinslaying Maedhros , until I got to the brackets. I'm hopeless, I know! I've seen one Maedhros and he was very very SWOOOOnable. But if he looks like one of Jenny's Maedhros paintings, won't he look like the rest as well? Aurelin, there is a fellow at my school with red hair who at first I thought might possibly look like Maedhros, but I decided he isn't quite as handsome after all. SW :D:D:D:D:D:D:D:D:DN for my two favourite Elven brothers (Maedhros and Maglor)!!!!!!! Doni! Hi! I think I could guess that you were Aurelin's partner in crime! Thanks for your comment on my 'Maedhros' drawing. I will put up a Maglor soon! .. though he isn't drawn as well, imo! You have a point, that all of Jenny's long haired Maedhros' should look alike, but I think there is something about that particular one! The boy I am talking of does not have quite that, how to say it!..determined expression on his face! Not that this boy could possibly be as good looking, but he is 'similar'! He looks more like that early drawing, 'Humiliation', is it called? The one where the orcs are just about to chop off his hair! I will look out for more Maedhros doubles (or Maglor!) and keep you informed! But they will be in England! Much as I love all the 'sons', I am into swooning for Valar at the moment, so I am going for Aulë today, because I feel like creating something!! Last edited by Lady_Aranis on Tue Jan 03, 2006 11:11 am, edited 1 time in total. It has a nice ring to it! Doni - I would be very very startled if I saw a guy who was as gorgeous as Maedhros or Maglor on the pics. Questions like "Have I gone completely crazy?" and "Am I seeing things?" would arise immediately. Oh, the "Humiliation" Maedhros! :idea: Now that you brought my attention to it, he does look somewhat different from the "Forgive me my brother" Maedhros or the even later ones. But you never know what is going to happen! I have not been as good a girl to get such a (Christmas)-present! The poems - I'm of the old fashioned mind that a poem should have rhyming but I am awful with coming up with those; so I am always very cautious of free verse since I get it in fluxes - both understand and write. Hmm, who will get today's swoon - Fingon, because I tend to overlook him a bit even though he brought M back from Thangorodrim. Aurelin wrote: Let's start an Elf-hunt! 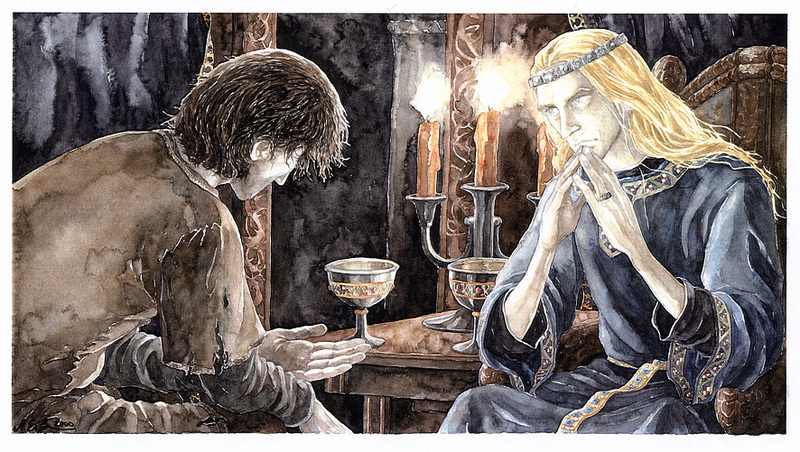 There's a guy at my work who somehow has very Elvish looks, but unfortunately, he doesn't resemble any of the portrayals by Jenny Dolfen or Catherine Chmiel... Perhaps there's something of Anke Eissmann's Finrod in him though. Me too! One of my New Year's resolutions will be to spot and report as many look-alikes to you as I can! Aurelin, I am sure you are a good-enough girl to get such a present! We just have to find one. Can't buy them in the shops, unfortunately! May the hunt begin ! It would make sense that I'd have seen someone by now, as I work in a store and there are lots and lots of people in and out of it but besides a few who could make an Elf if they had longer hair, I've seen none so far. Of course my co-workers keep their eyes on the guys too (most of us are a little over 20 ) but their taste in men is so so different from mine. so here's one for Námo Mandos, who I don't often think of in a good light! I wonder if the reason for that is fire-spirited !? Aurelin wrote: I would be very very startled if I saw a guy who was as gorgeous as Maedhros or Maglor on the pics. Well, in my opinion, Ethan, my Maglor-look-alike friend, is quite gorgeous enough. Hey, have any of you here seen Stargate, the movie? I think that Jenny's earlier Maedhros (especially in Forgive Me, My Brother) looks rather like Daniel (played by James Spader). For one thing, their hair style is similar. Anyhow, Daniel is pretty darn cute, too. I'll echo Aurelin's sw n for the wonderful and tragic Findekano! I have seen a very few folk who look almost as good! You must be looking in the wrong place, Aurelin! I understand the problem with co-workers having rather a different taste. When I worked in London, my colleagues were always looking out for very different types! They thought my 'taste' was odd, and I certainly thought their's was! Many of my present colleagues like Elves, and they cover a vast age range! ...you know me too well, Aurelin! But I do have a sort of admiration for Mandos, and I think it was not the easiest of roles being the Doomsman of the Valar! Not much room for fun and games?? I like both Forgive me my brother (beautiful!) and The Kinslayer, but for rather different reasons. I think I would go with you, Doni, on the former for the near 'innocence' (though this is post-kinslaying!!) of that picture. The Kinslayer says something very different to innocence! I am afraid I have not seen Stargate, the movie! I will keep a look out for that too, now! Ohhh, who to swoon for today? I totally agree about the wonderful and tragic Findekáno! Yup! Swoon for Findekáno, who rescues Maitimo! He is. The trouble here is that the genotype is traditionally blonde hair, blue eyes and a somewhat more heavier build. Of course by now there has been a lot of mixing of blood but still, bone-structure like the Elves have does not pop up usually, specially in men, in Estonia. I could not possibly choose between the Forgive me-Maedhros and the Kinslaying one. Perhaps because I mix them up in my head so that I cannot really separate them. One is cute cute, the other creepy cute . Jenny's Maedhros is cuter (we have fallen to complete fangirl mode, haven't we!? ) than James Spader but there are similarities. I've seen the Stargate movie but I had to check the IMDB for his picture since the actors of the series are deeply rooted in my head, so that the movie ones have faded out. They thought my 'taste' was odd, and I certainly thought their's was! Most of the time I am at their taste and i do not only speak of the appearance of the guys. They are some years younger than I and I guess they have different ideas as to what is important; plus I would half-expect the guys to be able to banish Orcs and battle with swords and bows and so forth, which cuts down on the possible canditates ! Fantasy and epic movies have ruined me! Mandos came off as symphatetic in ?was it the severance of the marriage of Miriel and Finwe? Or was it that he opposed with Ulmo the bringing of the Eldar to Valinor in some variants of the story. Anyways I recall that I quite cheered for the "guy" at one point or the other. *swoons today for Amrod and Amras* I've always imagined them to have been quite a mischievous pair of rascals in Valinor. No swooning in this thread for a couple of days! Well, I had better swoon away, then! Aurelin, you say the genotype where you are is not particularly elvish in character! If you can find a country whose genotype is elvish, please let us know!
. Yay! Is this what you mean by 'fangirl mode'? Some of my younger friendsdon't understand me very well at all.. ..though we still get on well. And a lot of them seem to have no interest whatsoever in men that can fight orcs, and use swords and bows! Whatever is wrong with them? Amrod and Amras..hummm....I have quite a few thoughts on that pair, but I will put that in writing in the Reading Room soon. It covers a lot of pages! you say the genotype where you are is not particularly elvish in character! If you can find a country whose genotype is elvish, please let us know! Though since Tolkien did write the mythology for England and took the western Europe as the place of action (so to say), the population there would be more "elvish" - aka Noldorish/Sindar, than here. Is this what you mean by 'fangirl mode'? I was more thinking of the word "cute" creeping into most sentences in my post! And a lot of them seem to have no interest whatsoever in men that can fight orcs, and use swords and bows! Whatever is wrong with them? Hmm, a swoon for a Maia - I would say Tilion - is it only me who has thought of his reason for stepping up to steer the Moon a bit goofy since it was all because of Arien and her choice??? A double-sw 8)8)n for Finrod and Maedhros, the light and dark of Noldorin wisdom . I once dated a guy with long black hair. I loved when he let it down, but he always wore it pulled back in a pony tail in public . He wasn't particularly elvsih, though. Of course, he was of Italian descent, so he had darker skin....but he did have a slight build, for what that's worth. My sister has been dating a US Marine, who is currently on his third tour in Iraq. He's killed people, and has been trained in all sorts of combat (with deadly force). I'd trust him to take out some orcs, if need be, but I have to admit that that aspect of his personality is a bit...creepy. I know he could beat up anybody who gave my sister problems, but I don't seem to trust him more on that account. It is hard to swoon for the Valar. They are above my likes and dislikes. But I will offer my admiration for Elbereth, the Lady of the Stars, whose beauty would be too much for me to endure. That was beautifully said! You could name an artwork like that. I can see how it can be creepy, MithLuin. Since I am of one mind about Elbereth, an admiring swoon from me too! Have you all seen Jenny's new picture - Glorfindel and Ecthelion? That's definitely my Glorfy. *sw n* And, Ecthelion looks just right as well. I forgot to tell you, rowanberry, how magical your sig pic is! I have searched for a proper lantern like that but all the ones I've seen have been too metallic or too fake. That Glorfy is like I have imagined him as well - which is kind of funny - that the picture we have of Glorfindel in our heads tends to be that similar, while say, Beren, a somewhat more major character I do not know for sure how I see him and I bet he is different in everyone's mind. Aurelin wrote: we have fallen to complete fangirl mode, haven't we!? Aurelin wrote: I would half-expect the guys to be able to banish Orcs and battle with swords and bows and so forth, which cuts down on the possible canditates Wink! Fantasy and epic movies have ruined me! No, James Spader isn't exactly the same sort of cute as Maedhros, though I do find him quite swoonable in Stargate. I like Jenny's new pic. I only wish she were doing more Sil art these days. Glorfindel looks wonderful; he's SOOOOOOOOOOOO much better than that girly elf on the LotR movie card game. As for how he matches up to my mental image, I think he's a bit different, but then I've never really had a very clear view of him, anyway. I guess today's swoon goes to Glorfindel, who was sadly cheated out of his role in one of my favourite little scenes in the LotR.